Getting sued by current or former employees happens more often than you might think. In fact, the number of lawsuits filed regarding wage-and-hour laws alone in 2011 went up 32 percent from just three years prior. Don’t be too busy to check in and ensure you aren’t breaking laws or otherwise opening yourself up to a potential lawsuit — no small business owner has the time, or money, for that. There’s a plethora of advice out there on the subject of protecting your business from lawsuits. Before you read on, remember, you should always consult your legal counsel to ensure you are complying with federal and state laws. Laws regarding certain practices, such as non-compete agreements, vary widely from state to state. SBA has compiled a list of some of the most helpful tips from around the Web. 1. Lots of shoppers skipped the mall, even as retailers kept slashing prices. Store traffic in the week leading up to Dec. 22 sank 22 percent, with sales growing at the smallest rate since 2009, ShopperTrak reports. There is a lot of information and then there are even more questions about doctors who are accepting Affordable Care Act. There is also plenty of discussion and questions involving how patients can find doctors that do accept Affordable Care Act coverage. Here are links to article and information provided both by the federal government and the news agencies. I feel I must give a disclaimer regarding information provided from the news agencies. These articles are to give you an idea of what people are saying and hearing, and there is no guarantee that what is being reported is accurate or current. Where can I find provider information? What is the news reporting? This post is licensed CC-BY SA 3.0, and may be shared and reposted with attribution. Please include a link back to the original, which will contain the most up-to-date version. Last year, the USPTO released a widely cited report entitled “Intellectual Property and the U.S. Economy: Industries in Focus.” This report emphasized the importance of IP to the U.S. economy, claiming “the entire U.S. economy relies on some form of IP,” and estimating that “IP-intensive industries” accounted for 40 million American jobs and 35% of the U.S. GDP in 2010. While many pro-IP groups hailed the report as demonstrating the importance of IP to the American economy, the report was widely panned by critics who pointed out that the definition of “IP-intensive industries” was so broad as to be meaningless. Indeed, according to the report, the number one IP-intensive industry by employment in the United States was… grocery stores. Although supporters of stricter IP regulation and enforcement continue to rely on the report to justify policies relating to copyrights and patents, the vast majority of the report’s purported economic benefits were attributed to trademarks. USPTO’s report was released in March 2012, and received a lot of attention. Just one month prior, the National Science Foundation (NSF) released the findings of a survey on business use of intellectual property. While a few sites picked up on the NSF report last year, it received far less media attention than it deserved. Why? Perhaps because it turns out that if you actually ask, the vast majority of businesses report that intellectual property is not important to them. Infojustice.org was among the few noting that the NSF’s findings directly contradict the USPTO report. The initial NSF report, published in February 2012, reported data from 2008. However, it has recently been updated to include data from 2009 and 2010. But wait – surely I’m making all this up. If “IP-intensive” industries account for 40 million jobs and 35% of GDP, intellectual property must be very important to businesses. What’s this “vast majority,” then? The U.S. Small Business Administration (SBA) issued two final rules in the Federal Register today, revising size standards for firms in two North American Industry Classification System (NAICS) sectors, namely, Utilities (Sector 22) and Construction (Sector 23). Size standards define the maximum size a firm can be and still be considered a small business. The revised standards reflect changes in marketplace conditions and public comments that SBA received to its earlier proposed rules. New size standards will enable more businesses in these sectors to obtain or retain small business status; will give federal agencies a larger pool of small businesses from which to choose for their procurement programs; and will make more small businesses eligible for SBA’s loan programs. For industries in Sector 22, Utilities, SBA increased revenue-based size standards for three industries and changed the basis for determining business size from megawatt hours to number of employees in 10 electric power generation, transmission, and distribution industries. SBA retained the current 500 employee size standard for the one remaining industry (NAICS 221210) in the sector. The final rule also removes Footnote 1 from SBA’s Table of Size Standards, which stated that a firm was small if it, including its affiliates, was primarily engaged in the generation, transmission, and/or distribution of electric energy for sale and its total electric output for the preceding fiscal year did not exceed 4 million megawatt hours. More than 400 additional firms will qualify as small under these new size standards for Utilities and become eligible for SBA’s loan and federal procurement programs. A summary of current and revised size standards in sector 22, Utilities can be found HERE. The SBA increased two size standards in Sector 23 (Construction) and retained the current size standards for the remaining industries in the sector. Specifically, SBA increased the size standards from $7 million to $25 million for firms in the Land Subdivision industry, and from $20 million to $25.5 million for businesses engaged in Dredging and Surface Cleanup activities, which is an "exception" to the size standard for NAICS 237990, Other Heavy and Civil Engineering Construction. Nearly 500 additional firms will qualify as small under the new construction size standards and become eligible for SBA’s loan and federal procurement programs. A summary of current and revised size standard in sector 23, Construction can be found HERE. Sector 22, Utilities – (RIN 3245-AG25). Sector 23, Construction – (RIN 3245-AG37). The SBA is reviewing size standards by taking into account the structural characteristics of individual industries, including average firm size, the degree of competition, and federal government contracting trends. This ensures that small business size definitions reflect current economic and market conditions in those industries. The Small Business Jobs Act of 2010 requires SBA to review all size standards at least every five years. Most small businesses make charitable donations. In fact, surveys have shown that about 75 percent of small business owners donate some portion of their profits — about 6 percent on average — to charitable organizations each year. As we’re in the midst of the holiday season (and tax season looms), many small business owners are likely considering charitable contributions and wondering how such donations might impact the bottom line in terms of tax deductions. First, it’s important to choose the right charity and avoid certain pitfalls that could leave you in a bind. Many employers are still unsure as to their obligations under the Affordable Care Act. The Small Business Health Options Program (SHOP) Marketplace is a new program that simplifies the process of buying health insurance for small businesses. In 2014, SHOP helps employers with 50 or fewer full-time equivalent employees shop for, choose, and offer their employees high quality private health plans that fit their needs and budget. Beginning no later than January 1, 2016, SHOP will be available to employers with 100 or fewer full-time equivalent employees. To start coverage on January 1, 2014, you must select a plan to offer your employees and your employees must enroll in the plan by December 15, 2013. We intend to extend this deadline to December 23, so check back here for an update. After this initial enrollment period, you may enroll in SHOP on a rolling monthly basis. The deadline to enroll is always the 15th of the month for coverage to be effective the 1st of the following month. For example, if you enroll by April 15th, coverage will begin May 1st. If you enroll between April 16th and April 30th, coverage will begin June 1st. After you've offered your employees coverage, make sure those who accept the offer submit their enrollment forms to the agent, broker or insurance company. The following links provide additional answers to your questions or the option to sign up for email updates. NYS Health Plan Marketplace FAQ - Click on Small Business Marketplace in the box on the left of the webpage. Whether you are looking to move operations to pro-business locations with low barriers to entry or seeking to meet customer demands in growing markets, your mid-sized business needs to seek out places that share certain characteristics: thriving local economies, an availability of educated workers, a favorable tax and regulatory climate, quality infrastructure, and a high quality of life. Consider the ten cities listed below. All offer many opportunities while being relatively bereft of the restrictive taxes and regulations that can choke growth. These cities — half in the U.S. and half outside it — combine growing economies and low barriers to entry. These are the types of places you should look when you are looking to expand your midsize business. More from Middle Market Center. You know that when your business experiences downtime, your services, employees, and operations will be impacted, but have you ever been able to place a dollar figure on what that impact would be? The Cost of Downtime. Let our Downtime Calculator give you an answer! This tool takes several different factors into account, such as your business’ number of employees, sales volume, and how any amount of downtime you encounter could impact your bottom line. If you have ever experienced downtime in the past, this calculator can provide you with a financial estimate for the business impact it may have had. No hedging? No "How old do I look?"? Why hedge about it? How old do I look? Thirty. What religion are you? Mr. Grant, I don't know quite how to say this, but you're not allowed to ask that when somebody's applying for a job. It's against the law. You wanna call a cop? Good. Would you think I was violating your civil rights if I asked if you're married? About 1.2 million people have now gotten coverage through “Obamacare” nationwide. As of December 9th, 314.146 New Yorkers have completed applications, with 100,881 enrolled. Coverage starts as soon as January 1, 2014 and can begin any month after that. There has been a lot of speculation as to what obligations small businesses will have when it comes to their their employees and the Affordable Care Act. Media sources have spread inaccurate and unsubstantiated information regarding the law. The best place to get non-opinionated information are the government websites at the following links. The Federal Small Business Health Options Program (SHOP) Marketplace makes it possible for small businesses to provide qualified health plans to their employees. For 2014, the SHOP Marketplace is open to employers with 50 or fewer full-time-equivalent employees (FTEs). You may qualify for tax credits if you use SHOP. If you're self-employed with no employees, you can receive health coverage through the individual (not business) application process. We've searched high and low to bring you the first annual list of FORBES 100 Best Websites For Entrepreneurs. Whether you’re seeking advice on raising capital, scaling your business or looking for general industry insight, these sites are worth reading. The picks here are arranged in no specific order. Selected unscientifically, they have been chosen for their ability to address a range of topics of interest to entrepreneurs. Frequent posts and content quality helps get a nod. The list is a combination of practical tools – sites to crowdsource funding like Rock The Post or AngelList, or sites with educational resources, like Stanford’s eCorner – and inspirational advice from bloggers like Seth Godin and Steve Blank. A new customer-rage study shows more American consumers than ever are dissatisfied with the products and services we buy. Also, despite companies’ big-money efforts to create customer-care programs, we’re less happy with the service received when we complain. The study shows 56 million American households experienced at least one problem during the past 12 months, and about $76 billion in revenue was at stake for the businesses involved. "The moral of the story: Don’t invest in improving your customer service unless you’re going to do it right," says Professor Mary Jo Bitner, executive director of the Center for Services Leadership at the W. P. Carey School of Business at Arizona State University, which helped design the survey. "If a company handles your complaint well, then you typically become a more loyal customer. However, if they don’t, then you become 12 percentage points less brand loyal than if you never complained at all." This independent study is based on one originally conducted by the White House in 1976. The 2013 version is the sixth study wave, offering a clear comparison of customer satisfaction over the years. Customers are angrier than ever and no wonder: they're losing. The good news is with a few inside tips, they can get the satisfaction they deserve. According to the 2013 Customer Rage Survey, customers are complaining more since 2011. And the tables have tipped: more than half the time consumers complain, they don't get results. But as long as you have a reasonable complaint, there's no reason to just sit back and take it. The four key consumer frustrations cited in the report -- too few customer service reps, too many automated phone menus, spending too much time dealing with the problem, and having to contact the company four times to get a result -- each have solutions. "Need to contact a company? Or have them call you? Get customer service faster and easier." Go to GetHuman.com. Companies have more phone numbers and contact options than ever. GetHuman shows you how to get through fastest. While we are knee-deep in the holidays, 2014 is right around the corner. And if you’re like the majority of small businesses, email marketing will play an important role in your promotional efforts throughout the New Year. Don’t let the following small but common mistakes keep you from achieving your marketing goals! For 68 percent of consumers, familiarity with the person sending the email is the top reason why they decide to open. Take the time to double check the “From Name” and “From Email Address” you’re using to send your emails. U.S. Secretary of Commerce Penny Pritzker has announced that the competition for Phase Two of the ‘Investing in Manufacturing Communities Partnership’ is now open. More from the White House website. 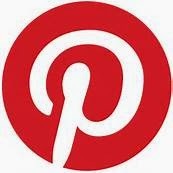 Pinterest offers a unique platform to business – a way to organically promote products while adding a personal touch through the creation of storyboard to support brand mission. Originally used by individuals as a way to discover and share items of interest, brands discovered a platform rich in active consumers and influencers. Pinterest has 4x the conversion per click of Twitter and a 27% higher conversion rate than Facebook, plus it drives 3x the traffic to sites than YouTube, LinkedIn, and Google+ combined. Now Pinterest is currently exploring promoted pins, which will show as regular pins with a “promoted label.” Time will tell the direction of promoted pins and the ROI on campaigns, but the introduction of this new business model has brands more interested than ever in Pinterest. Federal Trade Commission staff is asking top Internet retailers to review their websites to ensure that they provide complete and accurate information about product warranties before consumers make their online purchases, as required by the FTC’s Pre-Sale Availability Rule. The Rule requires retailers to make warranties available at the time of purchase for all warranted consumer products that cost more than $15. However, a recent staff survey found several instances of Internet sellers offering warranted consumer electronics and appliances for sale without disclosing complete warranty information. The letters note that FTC staff plan to revisit the websites after 90 days to ensure compliance with the regulations. The FTC cannot disclose the names of the warning letter recipients, as that is nonpublic information. Every professional services firm (marketing, business consulting, accounting, medical, law, et al) in the history of ever struggles with content marketing. Not necessarily from a tactical perspective, although “finding time” to create content is often a presumed obstacle in these organizations. But the biggest issue is fear. Companies that are paid for what they know instead of what they make are paralyzed by the thought of giving away their “proprietary processes” and “secret sauce” through a content marketing initiative. America's SBDC Biz Blog Listed as Forbes' "100 Best Websites for Entrepreneurs"
Burke, VA - The America's SBDC 'Biz Blog' was featured on Forbes.com on November 12, 2013 as one of the "100 Best Websites for Entrepreneurs." The article stated that they searched high and low for the best of the best. Whether an entrepreneur was seeking capital, growing their business or just looking for general assistance the Top 100 sites listed were "worth reading." Natalie Robehmed, Forbes Staff wrote "America's Small Business Development Center blog presents friendly lessons from founders who have been there and done that." 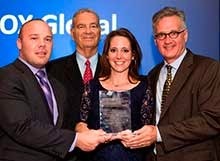 "Recognition from Forbes is a real tribute to our blog contributors and partners. Content from leaders like Gina Watkins of Constant Contact, Ramon Ray, Eric Spellman, Benetrends and so many others is what makes us successful, relevant and a premier resource for our SBDC business advisors and their small business clients," said Charles "Tee" Rowe, President & CEO, America's SBDC. 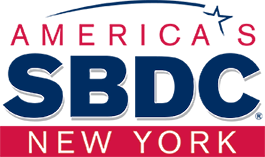 The America's SBDC Biz Blog was launched in 2011 with over 12 contributors, all Sponsors or Partners of the Association. The blog boasts a variety of posts from low-cost marketing techniques to franchise funding opportunities. The blog is featured in the America's SBDC weekly Newsletter and posts are also shared via Facebook & Twitter. Its a valuable resource for our SBDC Professionals, their clients and small businesses all over the country. America's SBDC (Small Business Development Center) Network is a partnership uniting private enterprise, government, higher education and local nonprofit economic development organizations. It is the Small Business Administration's largest partnership program, providing management and technical assistance to help Americans start, run and grow their own businesses. With about 1,000 centers across the nation, America's SBDC network provided business consulting to approximately 200,000 clients, training for more than 400,000 attendees, and other forms of management and technical assistance to approximately 600,000 small businesses and aspiring entrepreneurs last year. Spending on email marketing is projected to reach $2.5 billion by 2016, but even all that money doesn't guarantee conversions. To help boost your email marketing conversions, check out the tips in the following infographic by Monetate. Avoid batch and blast. Your customers aren't all the same, so why send everyone the same email? Segmented email campaigns produce a much higher click-through rate than undifferentiated messages. Read more at Marketing Profs. What are the biggest and most common mistakes business owners make when dealing with a disaster? Whether it’s property damage caused by a flood, or the loss of sensitive data thanks to a hacked email account, how you respond within the first few hours of the crisis can make or break your small business. Get tips on how to avoid the costly mistakes that could put the safety of your clients and your organization at risk at a free webinar hosted by Agility Recovery and the U.S. Small Business Administration on Tuesday, December 10. True stories about business owners’ pre-disaster missteps, plans not followed and errors made—as well as what they learned during the recovery phase, will be discussed. HOW: Space is limited. Register at https://www1.gotomeeting.com/register/625471417. Should Employees Have Freedom at Work? The question got a lot of laughter from the audience, just imagine it being asked in a heavy English accent with a wee bit of profanity behind it. Small Business Saturday falls on November 30 and there are a number of ways people can get involved. For more information on how to support Small Business Saturday in your area, or to get great Small Business Saturday marketing tips and resources, check out www.sba.gov/saturday or visit www.smallbusinesssaturday.com. Apple customers are emerging as an important new demographic, accounting for a massive 89% of mobile commerce sales. When Orbitz admitted that it ranks products differently for Mac users, citing 20-30% higher average order values, much comment was made about the difference between Mac and PC customers. But that is only half the story. When you factor in mobile devices, the new Apple demographic begins to have significant implications for marketers. Read more from Marketing Profs. Read HOW from the ASBDC. WASHINGTON – The U.S. Small Business Administration’s online portal is ready to accept nominations for its 2014 National Small Business Week Awards, including the annual Small Business Person of the Year award. Now in its second year, the dedicated web portal http://nationalsmallbusinessweek.sba.gov/ has made it easier to submit and track submissions of nominees for National Small Business Week. postmarked or hand delivered to the SBA no later than the end of the day, Friday, Jan. 17, 2014. Winners of the Small Business Person of the Year award and other award categories will be invited to Washington, D.C., in 2014 to compete for national titles and to attend National Small Business Week events. Using free social media tools is a great way to improve your business and increase your overall traffic. There are a lot of paid social media tools, but the next few are completely free and is extremely useful when it comes to managing, generating post, sharing content and improving inbound marketing overall. See them at Business Art of War. Small business owners often find themselves responsible for all aspects of their business, from sales and marketing to HR and, most importantly, keeping finances in order. Hiring an accountant is a luxury at first. Using mobile apps that help track business expenses is a great, cost-effective option. NYPL - New York StartUP! 2014 Business Plan Competition - Win up to $15k! The New York Public Library in conjunction with its sponsor, the Citi Foundation, is proud to announce the 5th Annual New York StartUP! Business Plan Competition for New York-based startup entrepreneurs with cash prizes totaling over $30,000. New York 2014 StartUP! gives aspiring entrepreneurs the opportunity to bolster their business acumen. Entrants gain practical insights about starting and growing a business, while learning about the comprehensive small business resources at NYPL's Science, Industry and Business Library (SIBL). • You must be 18 years of age or older, live in Manhattan, The Bronx, or Staten Island as a legal resident or US citizen, and wish to start a business in Manhattan, The Bronx, or Staten Island. • Start up businesses only. Operating businesses that have earned revenue and/or have paid taxes are not eligible. Any business incorporated prior to October 13, 2011 is not eligible to enter. • This competition is for For-Profit Businesses ONLY. Non-profits are NOT eligible. 1. Create an account on the StartUP! 2014 site on FluidReview. Note: Creating an account doesn't mean you've submitted an entry form. If you previously participated in the 2013 New York StartUP! Competition your name may already be in the Review Room site and you will need to reset your password. Your entry form must include the type of business you plan to start. 2nd Place Award: $ 7,500. 3rd Place Award: $ 5,000. 4th Place Award: $ 1,500. 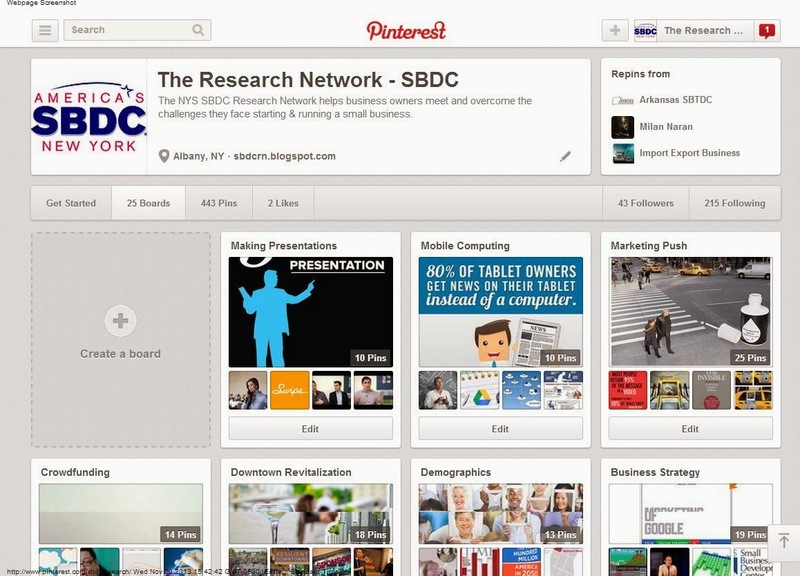 I invite you to visit and follow the Pinterest page for the NYS SBDC Research Network. You've probably heard a lot about Pinterest lately and noticed that familiar little P popping up at the bottom of articles and in catalogs and so on. This visual venue lends itself very much to the sharing of ideas, in our case, ideas about business. Most people who go on may not be impressed initially because having a good experience on Pinterest requires a bit of cultivation. Browsing the "popular" page will only show you things you've likely already seen and are the common denominator, and not tailored to you. However if you search for specific topics of interest to you, then you can begin choosing carefully the people and boards you wish to follow. Browsing Pinterest can move fast so images should read well on a small format. They should also be large enough so that when a Pin is opened, the photo is well presented. Of course, repinning other people's work or images should give credit and should not be pinned from a Google image search but from an actual webpage so that whoever clicks on it can reach the originating webpage. Pinterest is the domain of collectors. If you are into vintage American cars, you'll find a lot of others who are too. Japanese swords? Found it. Vintage locks? Ditto.You can tap into an audience that is very specific. Be choosy when deciding who to follow and people will be choosy in deciding to follow you, but when you tap into the right vein you can really find your people. Our research network contains boards that cover a number of issues that face our clients. Marketing, Making Presentations, Social Media, New York State (beauty), Selling Online, Foodie Business, Sports & Fitness Business and Business of Art. There are a number of others as well. Foodie: How does an artisan baker market their business? Social Media: How to use Twitter to repair a reputation. Have a look at the RN page and try searching for something that interests you. You may be surprised. And please share this page with any clients wishing to do a little browsing or reading. The NYS VBOC was recognized at the SBA National Business Awards Ceremony in Washington, DC on June 21, 2013 as the 2013 Veterans' Business Outreach Center of the Year. We are especially proud of the services these staff members deliver directly to veterans as well as the support they provide to other SBDC Advisors who regularly work with veteran clients. The sponsoring SBA Office of Veterans' Business Services made the selection from among its national network of 15 VBOC programs. The NYS SBDC network has been assisting veterans since its inception in 1984. For the first 15 years of its existence, the statewide program assisted veterans along with other entrepreneurial individuals in the state. In September 1999, assistance to veterans became a new priority when the NYS SBDC became one of four SBDCs in the nation to pilot the Veteran’s Business Outreach Center (VBOC) program that is funded through the SBA’s Office of Veterans’ Business Development. The NYS SBDC has been awarded subsequent grants, and has dedicated Veterans Business Advisers located at the Farmingdale, Albany, and Buffalo SBDCs. Farmingdale Business Advisor John Narciso, who was in DC to accept the award along with the current VBOC advisors, has been part of the VBOC program since the beginning, and was the statewide coordinator of the NYS VBOC program from 2006 through 2013. The current statewide VBOC coordinator, Michael Gragg from Farmingdale, Amy Amoroso from Albany, and John McKeone from Buffalo were in DC with John Narciso to accept the award. A report published by the Office of Advocacy analyzes the impact of an internet sales tax on small business. As the popularity of online shopping has grown, states have seen their sales tax revenues drop. Federal legislation has been introduced over the past several years to authorize online sales tax collection. With small business owners on both sides of the issue, the Office of Advocacy recognized the need for objective research for small businesses and policymakers. This report analyzes the number of firms that will be affected by the small seller exemption (SSE) if current legislation passes and how much e-commerce is likely to be affected. The report, An Analysis of Internet Sales Taxation and the Small Seller Exemption, was written by Donald Bruce and William F. Fox of the University of Tennessee’s Center for Business and Economic Research. The Securities and Exchange Commission voted unanimously to propose rules under the JOBS Act to permit companies to offer and sell securities through crowdfunding. "Consistent with the JOBS Act, the proposed rules would among other things permit individuals to invest subject to certain thresholds, limit the amount of money a company can raise, require companies to disclose certain information about their offers, and create a regulatory framework for the intermediaries that would facilitate the crowdfunding transactions." Note the SEC is "seeking public comment on the proposed rules for a 90-day period," which will end sometime in mid-January. See more from the SEC. Is the STEM job advantage a myth? Politicians, policy makers, parents and students assume that the straightest path to a great job is by majoring in what is often called a STEM discipline -- science, technology, engineering or math. Indeed, President Barack Obama has set a goal of creating a million new STEM college graduates in the next 10 years, along with 100,000 new teachers in those fields. Meanwhile some politicians are urging state universities to ditch unpopular liberal arts and embrace more STEM education instead. The popularity of STEM majors can be explained in large part by the belief that there are plenty of jobs in these fields. Under this view, these jobs that are going begging because not enough Americans have the skills to qualify for these positions. Americans also widely believe that students who graduate in STEM subjects will earn higher salaries. If many STEM majors aren't enjoying outsized salaries, maybe the assumption that there are many jobs available in these fields is wrong, too. In an in-depth article, The Chronicle of Higher Education took a long look at this question and concluded that the STEM job advantage is a myth. Think in an uncertain economy there's some safety in buying a franchise of an already-established brand? A new report suggests that's true only if you choose very, very carefully. The report found that 11 franchises—more than half ice cream or fast food—had the highest rates of failure of their federally guaranteed loans used to buy them in the first place, according to analysis of U.S. Small Business Administration figures done by BlueMauMau.com, a franchising news website. This is the same list that the agency provides loan officers of its most trusted lenders and banks throughout the country, the site says. Managers, you may rate 10 percent of your people "superior performers," 40 percent as "exceeds expectations," 40 percent as "meets expectations" and the remaining 10 percent as "below expectations." Sound familiar? This breakdown is known as a "stacked ranking" or "forced bell curve ranking." But, what is so bad about stacked rankings? In an Atlantic editorial, Bruce Schneier discusses the post-Snowden business-climate. The NSA relied on Internet giants to do surveillance for them (surveillance being a major part of the Big Data business model), and pre-Snowden, there was no real downside to cooperating with illegal NSA spying requests -- in some cases, spooks would shower your company with money if it went along with the gag. Post-Snowden, all surveillance cooperation should be presumed to be destined to be made public, and that's changed the corporate calculus. The harsh reality is that few small businesses can win by trying to imitate the big-box stores and slashing prices dramatically. Mega-businesses have a number of advantages in the price-slashing arena: They can demand low prices from wholesalers and they have a vast array of other products to offset the losses taken on the specials. But, that doesn't mean that you can't have a successful holiday sales season. After seeing every permutation of the 'game' global thermonuclear war resulted in total destruction, Joshua the computer in the movie War Games observed: "the only winning strategy is not to play." And then, he suggested, "How about a nice game of chess." Playing a different game can be your winning strategy as well. Don't compete on price for mass production items. Instead, focus on quality service, unique product offerings and a deep knowledge of your customers and your community. An Issue Brief published by the Office of Advocacy shows the changing makeup of America’s veteran business owners. See Advocacy’s Issue Brief Number 1, Profile of Veteran Business Owners: More Young Veterans Appear To Be Starting Businesses. For press inquiries or to speak with Advocacy’s Chief Economist Janemarie Mulvey, Ph.D., contact Elle Patout, Public Affairs and Media Manager, at (202) 205-6533 or elle.patout@sba.gov. WASHINGTON – The U.S Small Business Administration (SBA) announced new measures to help get small business loans into the hands of veterans by setting the borrower upfront fee to zero for all veteran loans authorized under the SBA Express program up to $350,000. This initiative will start on January 1 and continue through the end of the fiscal year. The announcement came during SBA’s National Veterans Small Business Week, an initiative on the part of the U.S. Small Business Administration to reach out to veteran entrepreneurs and business owners. During Veterans Small Business Week, SBA staff all across the country have been working with partner organizations on educational efforts, mentoring, and trainings to make sure veterans have the tools they need to start or grow their business. For more information about these and other SBA programs, visit the SBA website at www.sba.gov, or contact your local SBA field office. Here's contact information for your local SBA office. A report published by the Office of Advocacy measures the small business benefit of federal tax expenditures. Tax expenditures are provisions in the tax law designed to benefit specific groups of taxpayers. They are similar to spending programs but generally do not involve direct federal outlays. Rather, they work through the income tax system, taking the form of special credits, exemptions, deductions, exclusions, and preferential rates. This study estimates the utilization of federal tax expenditure provisions by small and large businesses in 2013. The report, Measuring the Benefit of Federal Tax Expenditures Used by Small Business, was written by John O’Hare, Mary Schmitt, Judy Xanthopoulos of Quantria Strategies, LLC. For press inquiries or to speak with Advocacy’s Chief Economist Janemarie Mulvey, Ph.D., contact Elle Patout, Public Affairs and Media Manager, at (202) 205-6533 or elle.patout@sba.gov. Do you think your customer service is more on point than ever? That the cutting-edge technology you've put in place has brought your customer game to a new level? That your self-help processes make it easier and more frictionless than it's ever been for customers to get their needs met and issues resolved? Well, there's a good chance you're wrong. So suggests a recent study of what customers are looking for by American Express. According to the report (which was produced by an independent testing firm and is based on customer surveys), regardless of technology, resources or access to multiple modes of 24/7 communication, the attitude and desires of the customer -- and the things that determine whether she is likely to be happy or disappointed -- haven't changed with the times. In other words, despite all the hype and noise of modern business, the customer service wheel has not been reinvented; in fact, according to most customers, "old-school" still rules. Stop trying to please everyone. Seriously. Stop it! The message behind today’s marketing post may sound a little counter intuitive. I’m going to explain why the key to gaining the visibility your business needs, is to be LESS visible. In fact, every entrepreneur who achieves meaningful success, sees their products or services ignored by the vast majority of people. It has to be that way! More from Jim's Marketing blog. The approaching holiday season provides an opportunity to show your employees that you appreciate the contributions they make to the success of your business. While there is some truth to the currently popular quip, "haters gotta hate," and you often can't please everyone, most employees appreciate gestures that you make to show them that they are valued and respected. Many employers opt for a holiday party. However, this is a tradition that many workers fail to appreciate, seeing the party as an obligation that cuts into family or personal time, forces them to incur costs, or places them into socially awkward situations. This year, before you plan the party, consider these three options for showing employees that you appreciate the work they put in day -in and day out. Followers ate fresh, organic produce, small amounts of seafood, and food rich in healthy fats like olives and avocados, while avoiding processed, packaged foods and saturated fats. Here's what he's finding with his healthy experiment. Pre-registration will ensure a seamless transition from the current site to the new site, which will have many new features and functionalities. NYSCR is requiring all current account holders to create their new account during this pre-registration period which will end on 11/22/13. All services on the new site will be free, but if you don't create an account during pre-registration you may encounter an interruption in service when the new site is launched in November. If you don't create your new NYS Contract Reporter account during this month-long pre-registration process, you will be able to create your new account when the site is launched in late November. So create your new individual account for the new NYS Contract Reporter: start at https://www.nyscr.ny.gov/pre-registration/. Note: If you are a state agency or municipality receiving this message PLEASE DO NOT create an account now. This message is intended for business account holders only. Your agency account will be transferred to the new site, and you will be notified.